So Daringly Relevant It Scares You Pantless! It's a game of truth or dare, minus the truth. You have a choice to be either a watcher or a player. Over the brief period of twenty- four hours, a phone app puts teens everywhere in danger through dares that are played for cash payments. In the meantime, a fan base sends in that money to watch certain players take on requested dares, specific to information picked up from their social media profiles. 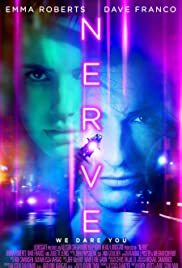 It is a nationwide phenomenon that is the subject of Nerve, based on the Jeanne Ryan novel, a timely piece of summer entertainment that gives teenagers what they want simultaneously with what they need. Thank goodness this type of mobile game doesn't exist, but thank even greater goodness that directors Henry Joost and Ariel Schulman (Catfish, Paranormal Activity 3 and 4) made it feel as close to real as we could probably grasp it. The camera takes on a DSLR feel with its Steadicam effects and shifting in and out of focus, all made the more heart-pounding to watch with the intense, stylistic colors that make every image pop. The Rob Simonsen score compels with a pulsing synthesizer, adding to the imprisoning effect of the city skyline illuminated at night by the usernames of the game players. But the directing team's most creative narrative technique is the unsettling effect of putting us behind the point of view of the phone screens, as if we're the watchers communicating with the players. Joost and Schulman similarly draw us in at the start of the movie with a wonderfully stylistic opening hook, where a teenage girl's PC fills up the entire screen as if we were the ones running the show. The teenage girl of this story is Venus Delmonico (or Vee for short), played by Emma Roberts. She always has more social media tabs open than she can keep track of, which matches her cluttered mind that is set on leaving her mother's home for college. The problem? She doesn't have money to afford the dorms. But Vee does not consider herself a risk taker—she can't even ask a boy out on a date without her best friend volunteering to do it for her. Here is where the game "Nerve" steps into her life, offering a possibility to win hundreds upon thousands of dollars for each dare she achieves. Her first dare: kiss a stranger. Her second dare: take him into the city. Her third dare: try on a sparkly jade dress that costs four- grand. You can figure out the pattern from here. As the night goes on, the money is deposited into her unsuspecting mother's checking account, a romance sparks between her and the stranger she meets from the dare, and she becomes one of the top 10 worldwide players, helping her to at last feel free and respected through her rebellion. It's worth respecting the challenge Emma Roberts and her male co-lead, Dave Franco, went through to complete these dares. They work rather well together, better than most teen couples on screen, although I have to wonder, was adding a predictable love story necessary? I would not say that the screenplay turned out one-hundred-percent bullet-proof. With a story as big as this one, half of the unnecessary subplots had either little resolution or none at all. When Vee gets a tattoo for one of her dares, she tells her newly found boyfriend about the time her brother died. It could have been a meaningful moment, except it's never mentioned again, nor did it add anything to the story. Along with all the loose-ends and time- wasters, I also have one blaring question to ask: how did the police not know that any of this was going on? With a phenomenon as big as Nerve ruling teen culture, I feel like the police would have some involvement, but they didn't. I don't know how you just miss something like that. Nonetheless, I'd be lying if I said I did not enjoy Nerve, because it delivered exactly what it promised: on-edge terror that never stops and splendidly pays off in the end. I am sure that if you are a boy or girl also obsessed with the juvenile culture of mobile gaming, then this should just as well please you.